How do I use WinSCP? If you do not already have WinSCP, you'll need to download and install (click here) WinSCP. For this guide, we'll be using WinSCP version 5.13.3. Once you've installed WinSCP, open it up and you'll be prompted with a Login screen as shown below. Set the File Protocol to FTP. Leave the Port number as-is; this will always be 21. Optionally, set the Encryption field to TLS/SSL Explicit encryption. 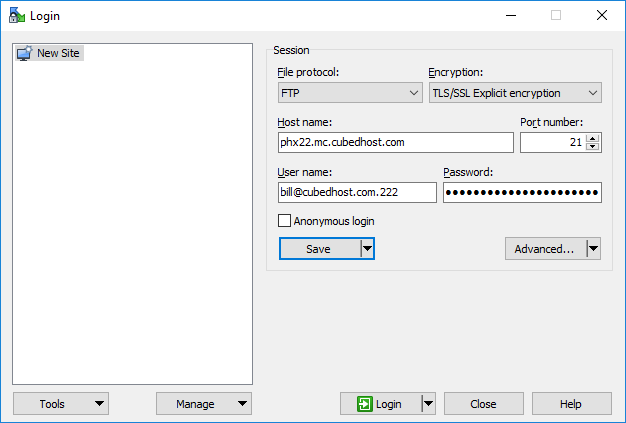 This will encrypt your connection between your computer and the physical server for your file transfer session. Next, set the Host name to the Host/IP field, as well as the User name to the Username field shown in Prisma under Advanced > FTP Access. Finally, set the Password field in WinSCP to your Prisma password. If you wish to save your credentials, click Save, check the Save password (not recommended) box if you wish to save the password, followed by OK. For security reasons, we advise against storing the password locally if you're on a shared system. To connect, click the Login button. If you have successfully followed the guide above, you should be brought to a view that shows both your local files (defaults to your Documents directory) on the left side and your server's files (defaults to / or "root directory") on the right side. 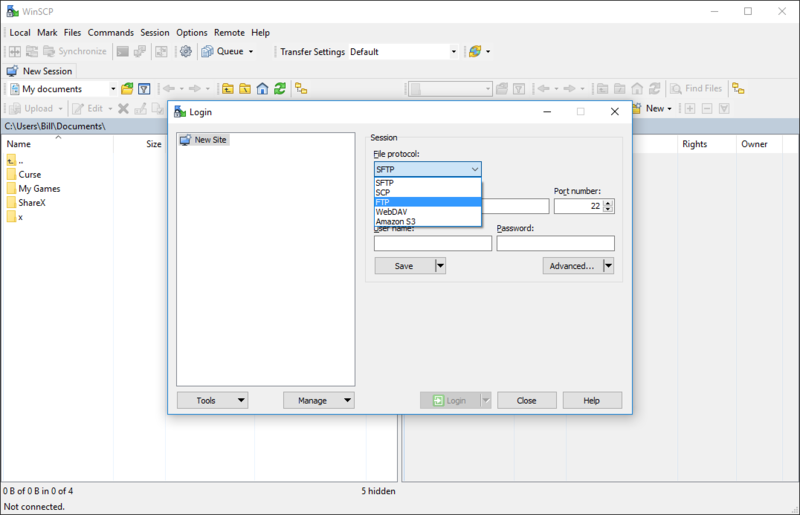 Navigate to the files in WinSCP and drag/drop files from the left panel to the right panel. Navigate to the files in Windows Explorer and drag/drop files to the right panel. Drag/drop files from the right panel to the left panel in WinSCP. 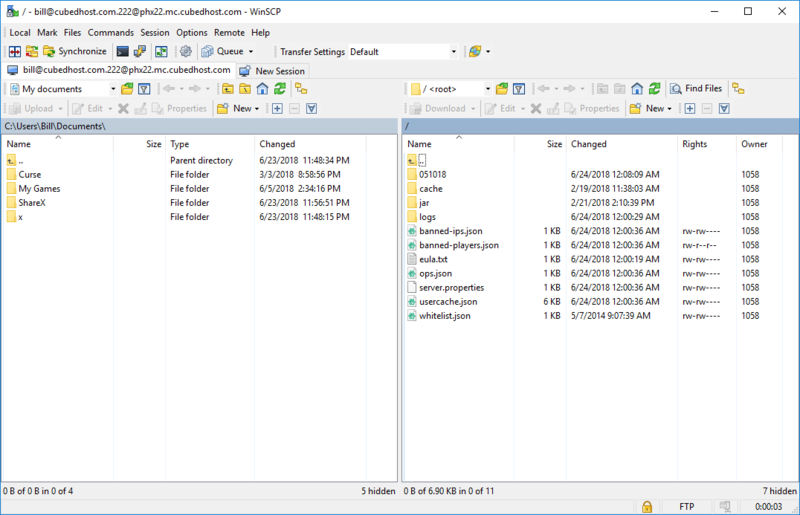 Drag/drop files from the right panel in WinSCP to Windows Explorer. Multiple files can be selected by either clicking and dragging or by holding Ctrl and clicking multiple files. Once done, release Ctrl and drag/drop files appropriately. What about FTP for web hosting and Multicraft?